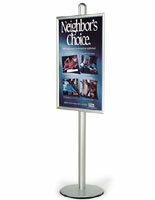 Snap Open Frames : This snap frame stand is a bold marketing tool to generate interest in a sale or promotion! 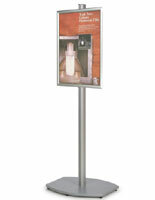 BRAVA Snap Frame Stand: 24" x 36"
If you are looking for an advertising display that will stand out on your showroom, lobby floor or other indoor presentation, then this BRAVA snap frame stand is what you need. 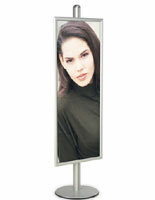 Standing 6ft tall, on a sturdy metal base, the aluminum pole holds one 24" x 36" snap frame. 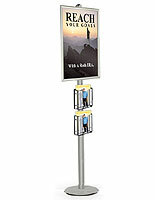 The snap frame stand is a simple concept, yet an attractive, functional poster holder display. 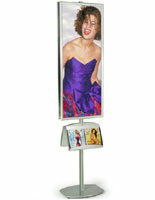 The poster holder on this BRAVA standing frame display has a snap design that is easy to use. 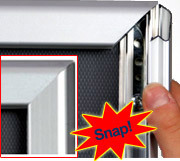 Snap frames make poster changes a breeze because the sides clip down over your sign or poster. Simply lift open the sides of the frames, insert your image inside, cover it with the lexan overlay, and snap the sides down again. 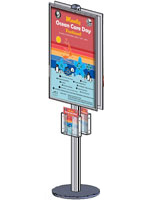 Unlike sign frames that must be loaded from the back, this poster frame does not have to be removed from the snap frame stand. 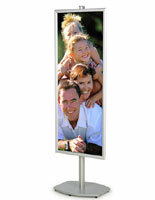 The snap poster frame includes the lexan cover so that your advertising images are kept protected and preserved. 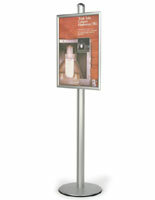 Advertise your product or service with the sign frames in just seconds! The metal pole and base that make up this BRAVA snap frame stand are heavy duty and well constructed. We build the poster stand with the intention that they will last for years. With the base weighing 20lbs, you can rest easy knowing that the snap frame stand will remain steadfast for your indoor presentation. The base of the display system is also built with black plastic "feet" on its underside to prevent damage to your floors. To attach the poster holder to the snap frame stand, slide the connectors along the groove in the metal pole, beginning at the top, and tighten the screws at your preferred height. It's as easy as that!